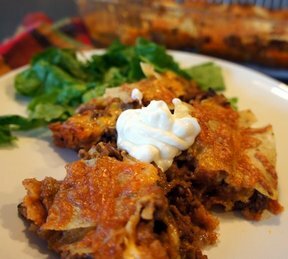 Tortilla chips are layered with taco seasoned beef, then cheese and topped with more chips. A simple weeknight meal that is sure to please. Serve it with a side salad and you're done. Brown ground beef and onions in butter; drain. Stir in seasoning, tomato sauce and water; simmer 30 minutes. 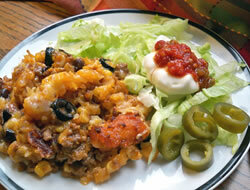 Layer tortilla chips, meat mixture, Cheddar cheese and more chips. 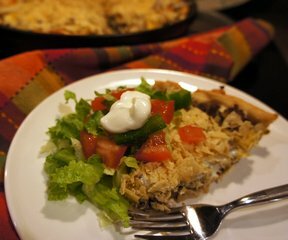 Bake 30 minutes at 350 degrees F.
"I made this and it was super simple and I loved the way the chips got a little soggy on the bottom, it reminded me of enchiladas. 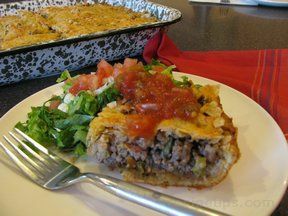 Great for an easy meal with ingredients you probably already have."